has a cooling thermal nature. It has a coarser, sweeter, slightly sour and nuttier taste than other types of flour corns. It is the basis for many traditional Native American foods. 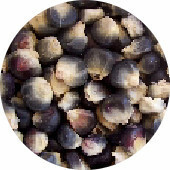 Blue corn has not been hybridized and contains 21% more protein, 50% more iron and double the magnesium and potassium that is contained in yellow or white corn. Blue Corn is a qi tonic, diuretic, nourishes the heart and stomach, stimulates the flow of bile, improves appetite, regulates digestion, lowers blood sugar, treats difficult urination and water retention, encourages wellness of the teeth and gums, prevents the formation of urinary tract stones, tonifies kidneys thereby overcoming sexual weakness, supports the colon and reduces kapha.